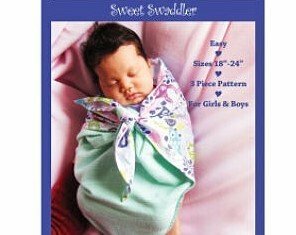 Turn the old age practice of swaddling into a contemporary trend with this easy to make swaddler pattern. This 3 piece pattern comes in sizes 18" to 24" and is perfect for both girls and boys. Whether napping or being cradled, any baby is guaranteed to be as cozy as possible. Purchase of pattern and fabric required. Requires purchase of pattern and fabric.